WiFi Security is user-friendly, but doesn't have the power or features experienced VPN users will expect. For Webroot fans only. 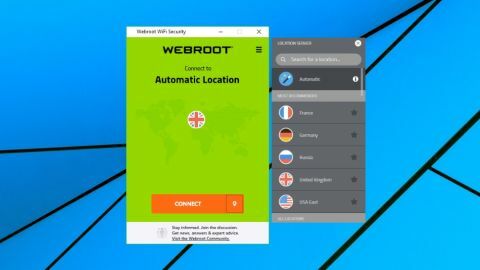 American security vendor Webroot is best known for its ultra-lightweight antivirus, but the company has now extended its range with Webroot WiFi Security, a simple VPN for Windows, Mac, iOS and Android devices. Although the service is branded as Webroot, the apps, underlying network and VPN expertise largely comes from SaferVPN, a capable provider which offers decent performance and some useful features. WiFi Security has a network of 35 locations spread around the world. That can't match the best of the competition – ExpressVPN has 148 locations in 94 countries – but WiFi Security's locations are well positioned, and most users will have one nearby. Signing up with WiFi Security doesn't just get you access to SaferVPN's servers. Webroot adds a unique feature (on Windows, Mac and Android) of its own in BrightCloud, the company's sophisticated web filtering technology, to prevent you accessing dangerous websites. Forget the basic DNS-based blacklists offered by a few other VPNs, what you're getting here is just the same up-to-date threat information that powers Webroot's own security suites. Webroot WiFi Security looks reasonably priced at $40 (£30.77) for a one-year, three device service, which comes to $3.33 or £2.56 a month – although it rises to $60 (£46.15) per year, the equivalent of $5 or £3.85 a month, on renewal. Covering five devices costs $60 (£46.15) for year one, $80 (£61.54) – $6.66 or £5.12 per month – on renewal. To put that in perspective, Private Internet Access currently costs $6.95 (£5.46) for monthly billing, dropping to $3.33 (£2.62) if you pay a year upfront, which covers you for up to five devices. There are no other subscription options, unfortunately – no monthly billing, no two- or three-year plans with healthy discounts. Sign up via Android or iOS and you'll get a free 7-day trial. You don't get this option with desktops, but if you create an account with your mobile, you can then sign in with your Windows or Mac, and try out the service. This is especially important because, unusually, Webroot doesn't offer refunds. That's a definite problem for a VPN, when you've no idea how it'll work for you, so it's important to do as much pre-purchase testing as you can. The policy explains that 'we do not collect or log any browsing activity, IP addresses, downloaded data (or shared or viewed data), or DNS queries.' That is, Webroot doesn't keep your browsing history or log the content of whatever you're viewing or downloading. There is some session logging, with the service recording the date and time when a session started and finished, the amount of data transferred, the VPN location you've accessed, the country you've connected from (not the source IP address) and the number of devices simultaneously connected through your account. This leaves us with some questions. Can these logs be connected to your account, for instance? How long might the data be kept for? But if you're concerned, it appears that you can toggle a client setting to stop logs being sent to Webroot, avoiding these issues entirely. Webroot WiFi Security does have some logging, then, but nothing we haven't seen with many other providers. And having a trusted name like Webroot attached to the service gives us more confidence that the policy is accurate, and there's no other logging going on that we're not hearing about. Overall, privacy purists will frown at the session logging, but if you're mostly using the VPN for basic tasks – unblocking streaming sites, encrypting access to Wi-Fi hotspots – we see no special need for concern. Webroot's Windows client (essentially SaferVPN's software with Webroot's web filtering included) has a simple and stripped-back interface which anyone will be able to use, right from the word go. A flag displays your selected location, a list enables choosing from the full set, and you can connect with a click. There are barely any location-picking extras. You can't filter by continents, for instance. You can't expand a country to see individual locations within it. There are no load figures or ping times to highlight the fastest servers for you. Webroot has covered the key fundamentals, though. A Recommended list highlights servers you're most likely to use, a simple Favorites system places commonly-used locations at the top of the list, and you can view connection status and access locations by right-clicking the client's system tray icon. It's all very well presented and easy to use. The only small issue that presented itself is the inability to change to a new server until you've closed the current connection, but that only takes a click, and if you rarely change servers, you're unlikely to care. A sparse Settings dialog enables choosing your protocol (PPTP, L2TP and IKEv2, not OpenVPN). The client can automatically log in when you access insecure or untrusted networks, and a kill switch stops internet traffic if the VPN drops. That's almost it, apart from a 'launch at startup' setting. This is more limited than usual as although the client will launch along with Windows, it won't automatically connect. You must do this yourself by tapping the Connect button. Webroot's web filtering is built-in and activated by default. It's a definite plus for the package and will keep you a little safer, although if you do have any issues with it, you can disable the feature from the Settings panel. Webroot WiFi Security also has apps for Mac, Android and iOS. A quick look at the Android version revealed very much the same interface as the Windows build, with the same core features. It's not the most powerful or configurable Android VPN app we've seen, but as with the Windows client, it's easy to use and covers the basics well. Webroot doesn't support OpenVPN, which meant we weren't able to use our automated performance testing tools. Instead, we fell back on our older approach, manually logging in to a sample of WiFi Security settings, then checking download speeds with Speedtest.net, Fast.com and more. UK speeds averaged a disappointing 40Mbps on our 75Mbps test line. While that's enough for most tasks, the best VPNs manage 60Mbps and more. European countries similarly managed a below par 30-40Mbps, and a few locations were especially poor. The Netherlands delivered as little as 20Mbps, for instance, less than half what we would expect from a quality VPN. US performance much was better, ranging from 30-55Mbps when using the US east and west coast servers. Unfortunately, the problems reappeared when we went long distance, with Australia managing 10-15Mbps on a good day, and Thailand hovering around 5Mbps. Speed tests rarely give definitive answers, but from what we saw, WiFi Security consistently delivers lower speeds than leading VPNs (though usually still enough for browsing and video streaming). If performance is a priority for you, take the free trial available on the mobile apps, then run your own performance tests before you buy. As you might guess from the name, Webroot WiFi Security sells itself almost entirely on its privacy and security benefits. The website pays no attention at all to the possibility of unblocking Netflix, iPlayer or other platforms or content which might not be available in your current location. Does this mean WiFi Security can't unblock anything, we wondered? Nope. Despite only offering a single UK location, the service gave us instant access to BBC iPlayer. The US servers enabled viewing US YouTube content just as easily. That's not quite as impressive – we've only come across one VPN, ever, which couldn't bypass YouTube's flimsy defenses – but it's still good to know. Accessing Netflix is the real prize, of course. WiFi Security's 'US East' server was blocked, but connecting to 'US West' got us in. Webroot might not be interested in WiFi Security's unblocking abilities, but from what we can see, the service performs better than most. The best specialist VPN providers typically provide a host of setup guides, tutorials, troubleshooting resources and more, all designed to help you get the most out of the service. Webroot WiFi Security is, well, a little more basic. The knowledgebase had 26 articles when we last checked, and although one or two have some valuable details, most include a few lines of text with little that you couldn't have figured out for yourself. This isn't quite the problem it might be with some VPNs, though, as WiFi Security is relatively straightforward and unlikely to cause you many difficulties. If you run into problems anyway, you can contact Webroot support via a ticket system. That's not going to give you the speedy response of the live chat support available with some providers, but in our experience, Webroot support is generally helpful, reliable and faster than most. Webroot WiFi Security could work for undemanding folks who just need an easy-to-use VPN to protect browsing and email, but it doesn't have the features, speed, configurability, choice of locations or platform coverage to match the best of the competition.